Mafenide Acetate, USP is a white, crystalline powder which is freely soluble in water. Mafenide Acetate,USP For 5% Topical Solution is provided in packets containing 50 g of sterile Mafenide Acetate to be reconstituted in 1000 mL of Sterile Water for Irrigation, USP or 0.9% Sodium Chloride Irrigation, USP. After mixing, the solution contains 5% w/v of mafenide acetate. The solution is an antimicrobial preparation suitable for topical administration. The solution is not for injection. The reconstituted solution may be held up to 28 days after preparation if stored in unopened containers. ONCE A CONTAINER IS OPENED, ANY UNUSED PORTION SHOULD BE DISCARDED AFTER 48 HOURS. Store the reconstituted solution at 20° to 25°C (68° to 77°F). Limited storage periods at 15° to 30°C (59° to 86°F) are acceptable. The mechanism of action of Mafenide is not known, but is different from that of the sulfonamides. Mafenide is not antagonized by pABA, serum, pus or tissue exudates, and there is no correlation between bacterial sensitivities to mafenide and to the sulfonamides. Its activity is not altered by changes in the acidity of the environment. The osmolality of the 5% topical solution is approximately 340 mOsm/kg. Applied topically, Mafenide Acetate diffuses through devascularized areas. Approximately 80% of a Mafenide Acetate dose is delivered to burned tissue over four hours following topical application of the 5% solution. Following application of Mafenide Acetate cream and solution, peak Mafenide concentrations in human burned skin tissue occur at two and four hours, respectively. Peak tissue concentrations are similar following administration of the solution or cream. Once absorbed, Mafenide is rapidly converted to an inactive metabolite (p-carboxybenzenesulfonamide) which is cleared through the kidneys. Clinical studies have shown that when applied topically to burns as an 11.2% Mafenide Acetate cream, blood levels of the parent drug peaked at 2 hours following application, ranging from 26 to 197 µg/mL for single doses of 14 to 77 g of Mafenide Acetate. Metabolite levels peaked at 3 hours, ranging from 10 to 340 µg/mL. Twenty-four hours after application, combined parent and metabolite blood levels had fallen to pretreatment levels. Mafenide Acetate exerts broad bacteriostatic action against many gram-negative and gram-positive organisms, including Pseudomonas aeruginosa and certain strains of anaerobes. Data from in vitro studies on cell culture suggests that Mafenide Acetate may have a deleterious effect on human keratinocytes. The clinical significance of this information is unknown. 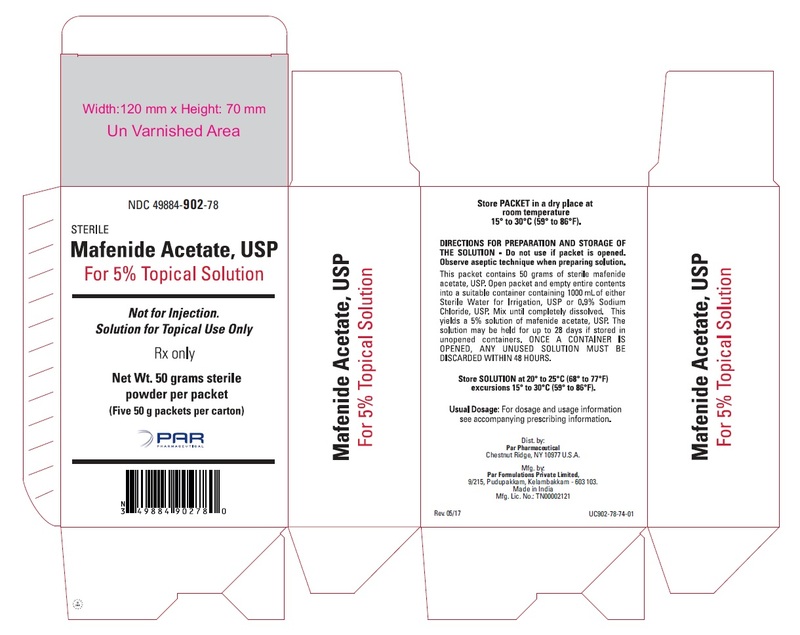 Mafenide Acetate,USP For 5% Topical Solution is indicated for use as an adjunctive topical antimicrobial agent to control bacterial infection when used under moist dressings over meshed autografts on excised burn wounds. Mafenide Acetate ,USP For 5% Topical Solution is contraindicated in patients who are hypersensitive to mafenide acetate. It is not known whether there is cross sensitivity to other sulfonamides. Fatal hemolytic anemia with disseminated intravascular coagulation, presumably related to a glucose-6-phosphate dehydrogenase deficiency, has been reported following therapy with Mafenide Acetate. Mafenide Acetate and its metabolite, p-carboxybenzenesulfonamide, inhibit carbonic anhydrase, which may result in metabolic acidosis, usually compensated by hyperventilation. In the presence of impaired renal function, high blood levels of Mafenide Acetate and its metabolite may exaggerate the carbonic anhydrase inhibition. Therefore, close monitoring of acid-base balance is necessary, particularly in patients with extensive second-degree or partial thickness burns and in those with pulmonary or renal dysfunction. Some burn patients treated with Mafenide Acetate have also been reported to manifest an unexplained syndrome of masked hyperventilation with resulting respiratory alkalosis (slightly alkaline blood pH, low arterial pCO2, and decreased total CO2); change in arterial pO2 is variable. The etiology and significance of these findings are unknown. Mafenide Acetate should be used with caution in burn patients with acute renal failure. Fungal colonization may occur concomitantly with reduction of bacterial growth in the burn wound. However, systemic fungal infection through the infected burn wound is rare. No long-term animal studies have been performed to evaluate the carcinogenic potential of Mafenide Acetate; however, the drug did not induce mutations in L5178Y mouse lymphoma cells at the TK locus. Animal studies have not been performed to evaluate the potential effects of Mafenide Acetate on fertility. A teratology study performed in rats using oral doses of up to 600 mg/kg/day revealed no evidence of harm to the fetus due to Mafenide Acetate. There are no adequate data regarding the potential reproductive toxicity of Mafenide Acetate in a non-rodent species, nor are there adequate and well-controlled studies in pregnant women. Mafenide Acetate should be used during pregnancy only if the potential benefit justifies the potential risk to the fetus. It is not known whether mafenide acetate is excreted in human milk. Because many drugs are excreted in human milk and because of the potential for serious adverse reactions in nursing infants from mafenide acetate, a decision should be made whether to discontinue nursing or to discontinue the drug, taking into account the importance of the drug to the mother. No studies have been conducted to specifically examine the effects of mafenide acetate on burn wounds in geriatric patients. The safety and effectiveness of Mafenide Acetate,USP For 5% Topical Solution have been established in the age groups 3 months to 16 years. In the clinical setting of severe burns, it is often difficult to distinguish between an adverse reaction to Mafenide Acetate and burn sequelae. In a clinical study of pediatric patients with acute burns requiring autografts who received Mafenide Acetate,USP for 5% SOLUTION in addition to double antibiotic solution (DAB) wound therapy (neomycin sulfate 40 mg and polymyxin B 200,000 units/ liter), the incidence of rash (4.6%) and itching (2.8%) in the group which received Mafenide Acetate USP For 5% Solution was not different from that experienced with (DAB) dressings alone (5.7% and 1.3%, respectively). Pain or burning sensation, rash and pruritus (often localized to the area covered by the wound dressing), erythema, skin maceration from prolonged wet dressings, facial edema, swelling, hives, blisters, eosinophilia. Tachypnea, hyperventilation, decrease in pCO2, metabolic acidosis, increase in serum chloride. Single oral doses of 2000 mg/kg of Mafenide Acetate as a 5% solution did not cause mortality or clinical symptoms of toxicity in rats. Mafenide Acetate for 5% Topical Solution is supplied as a sterile powder and is to be reconstituted with Sterile Water for Irrigation, USP or 0.9% Sodium Chloride Irrigation, USP. Aseptic techniques should be observed during preparation of the solution. Pre-measured quantities of 50 g of Mafenide Acetate powder are provided in sterile packets. The entire quantity of Mafenide Acetate, USP For 5% Topical Solution should be emptied into a suitable container which contains 1000 mL of Sterile Water for Irrigation, USP or 0.9% Sodium Chloride Irrigation, USP and mixed until completely dissolved. The reconstituted solution may be held up to 28 days after preparation if stored in unopened containers. ONCE A CONTAINER IS OPENED, ANY UNUSED PORTION SHOULD BE DISCARDED AFTER 48 HOURS. Store the reconstituted solution at 20° to 25°C (68° to 77°F). Limited storage periods at 15° to 30°C (59° to 86°F) are acceptable. Not for Injection -For Topical Use Only. The grafted area should be covered with one layer of fine mesh gauze. An eight-ply burn dressing should be cut to the size of the graft and wetted with Mafenide Acetate ,USP for 5% solution using an irrigation syringe and/or irrigation tubing until leaking is noticeable. If irrigation tubing is used, the tubing should be placed over the burn dressing in contact with the wound and covered with a second piece of eight-ply dressing. The irrigation dressing should be secured with a bolster dressing and wrapped as appropriate. The gauze dressing should be kept wet. In clinical studies, this has been accomplished by irrigating with a syringe or injecting the solution into the irrigation tubing every 4 hours or as necessary. If irrigation tubing is not used, the gauze dressing may be moistened every 6â€“8 hours or as necessary to keep wet. Wound dressings may be left undisturbed, except for the irrigations, for up to five days. Additional soaks may be initiated until graft take is complete. Maceration of skin may result from wet dressings applied for intervals as short as 24 hours. Treatment is usually continued until autograft vascularization occurs and healing is progressing (typically occurring in about 5 days). Safety and effectiveness have not been established for longer than 5 days for an individual grafting procedure. If allergic manifestations occur during treatment with Mafenide Acetate ,USP for 5% solution, discontinuation of treatment should be considered. If acidosis occurs and becomes difficult to control, particularly in patients with pulmonary dysfunction, discontinuing the soaks with the mafenide acetate solution for 24 to 48 hours may aid in restoring acid-base balance (see PRECAUTIONS section). Dressing changes and monitoring the site for bacterial growth during this interruption should be adjusted accordingly. Carton of five 50 g packets (NDC #49884-902-78). Packets - Store PACKETS in a dry place at room temperature 15° to 30°C (59° to 86°F). The solution may be held for up to 28 days if stored in unopened containers. ONCE A CONTAINER IS OPENED, ANY UNUSED SOLUTION MUST BE DISCARDED WITHIN 48 HOURS.